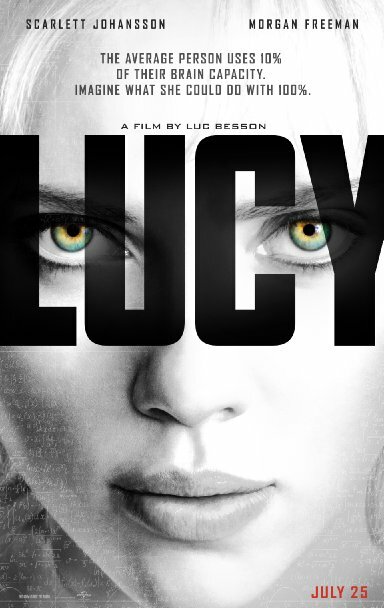 Lucy just might have earned the title as the dumbest smart movie I have ever seen. The first half is a compelling character driven story, whereas the rest of it turns into a pointless chase where a lot takes place but nothing significant actually happens. Sometimes you can watch a movie trailer and think it’s going to be dumb and then be surprised by the full feature. Lucy is exactly the kind of film you’d expect it to be. It’s mildly thought-provoking, aimless in scope, and illogical in every aspect. For a movie that tries so hard to be intelligent, I couldn’t help but feel more stupid (or is it stupider? I blame it on this movie) for coughing up the money to see it. Played by Scarlett Johansonn, who seems to be in just about everything lately, Lucy is a twenty-something living in Taiwan to study a little and party a lot. Her new boyfriend Richard is a lowlife who tricks her, handcuffs a suspicious briefcase to her wrist and then forces her to deliver it to the merciless Mr. Jang (Min-sik Choi). As you might expect, Richard doesn’t stick around the story for very long. The briefcase contains a drug that can allow complete access to the human mind. Following some tense and darkly comic scenes, Lucy eventually has the drug forced into her system. That’s the turning point for the rest of the movie, and is also where the story begins to fold in on itself. Professor Samuel Norton (Morgan Freeman) is one of the best minds on the subject of brain exploration and the organ’s astounding capabilities. Lucy looks him up, they eventually meet, and from there the movie becomes a bit of a mess. New characters get introduced that we don’t really know and most likely won’t be interested in enough to pay attention to. Scarlett Johansson delivers a good performance here. It’s entirely her movie, as the title suggests, and she keeps it going to the best of her ability. However, as the film progresses and Lucy’s mental capacity increases, the audience’s willingness to believe in and engage with what’s on the screen is completely erased. Directed by Luc Besson (The Fifth Element, Leon: The Professional), the film is lavish and fun to look at. He certainly has his own brand of style when it comes to filmmaking and is one of the few directors who consistently gives us strong female characters. Yet for some reason he chooses to use arthouse techniques here that make scenes come off as something out of an old avant-garde film and alienates the audience. What most disappointed me was the films lack of humor throughout its entirety. The opening sequences really have some darkly hilarious beats, but once the action gets pumped up all of that personality is squandered away for countless bullets and overturned cars. Besson’s filmography is known for its understated comedic tone and this fails to live up to his past work. So many people have asked me what I thought about this movie before it was released. I’ve been told, “Yeah it looks just like Limitless but with a woman.” First off, if you think that, you’re wrong and obviously have seen neither. Limitless, in my opinion, succeeded because it didn’t try to be more than it set out to be. Bradley Cooper’s character becomes a hyper-intelligent person but doesn’t lose his sense of humanity. On the other hand, Lucy turns into a deadly robotic heroine with a monotone voice and vacant eyes. It never sets up the rules of the story world for us to start, so when everything goes batshit crazy (which it absolutely does) we have no reason to believe in what takes place. Maybe that’s what it actually set out to accomplish. I just hope that’s not the case.